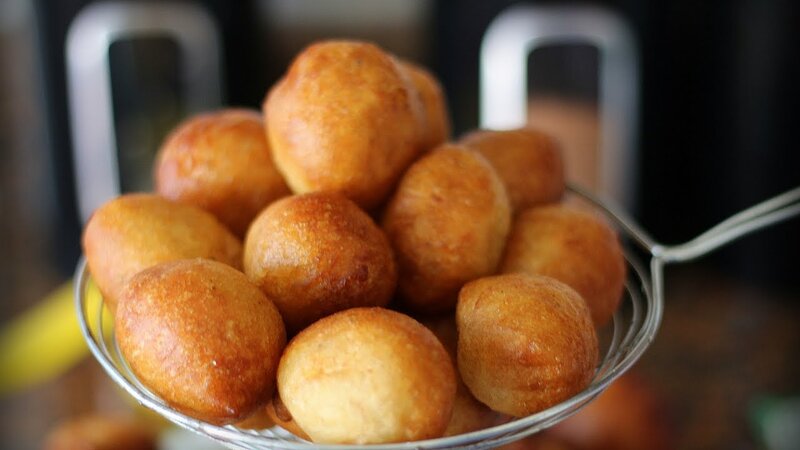 How to create the perfect Nigerian Puff-Puff? Germany the fasnascht and in France the beignet. Lokma, made with flour, sugar, yeast and salt. street snack, but what makes the Nigerian puff-puff so special? consistence to the final product. recipe of puff-puff as a substitute for yeast or you can add both if you prefer. and made from a solid yeasted bread dough. adding yeast, make sure it is not expired or else it might ruin your whole recipe. 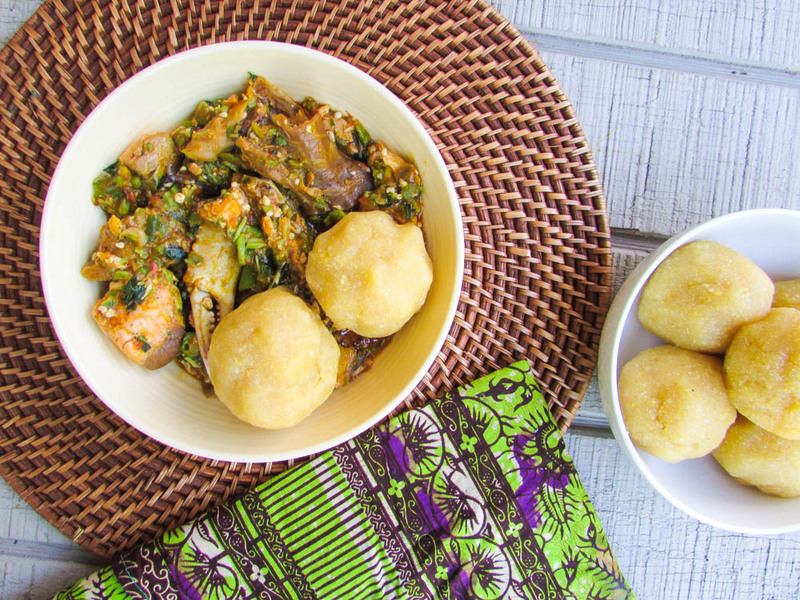 This entry was posted in Uncategorized and tagged bofrot, bread, how to make puff puff, Nigerian sweet dough balls, puffpuff, the perfect puffpuff. 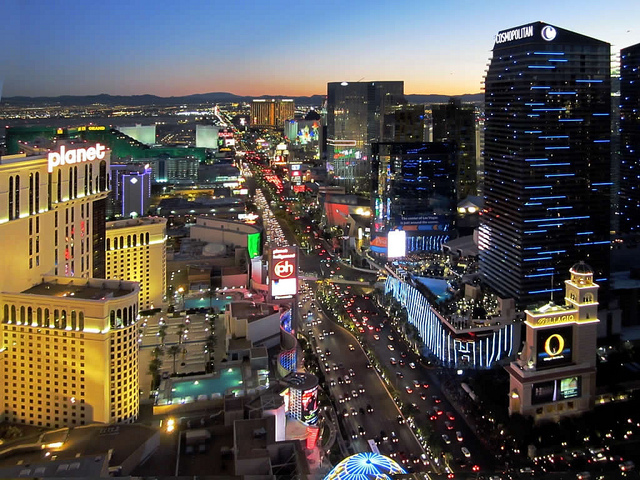 fans would visit to see the likes of Elvis and Frank Sinatra perform. here is so good and so plentiful that I’d struggle to choose anything else! There are eight or nine different veggie based dishes, some refreshing salads, others fiery curries. coffee set me back less than $20. Can’t say fairer than that! who just want a really large portion; perfect! 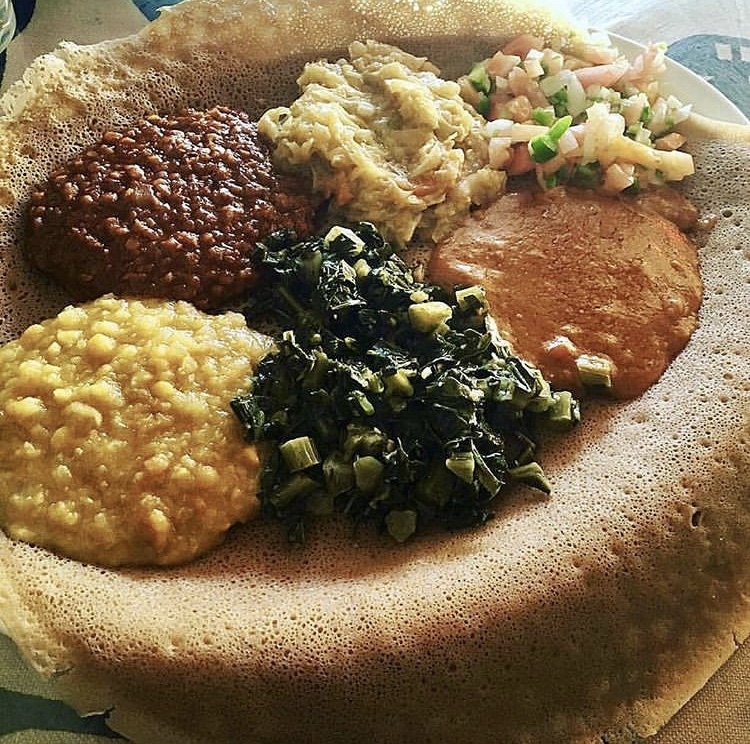 This entry was posted in Uncategorized and tagged eithiopian food, las vegas, merkato restaurant, niferian food, nigerian cuisine, Nigerian jollof, Will travel for food. I could describe Enyinna Nwigwe as a luxurious slice of chocolate cake, but it would be an understatement. 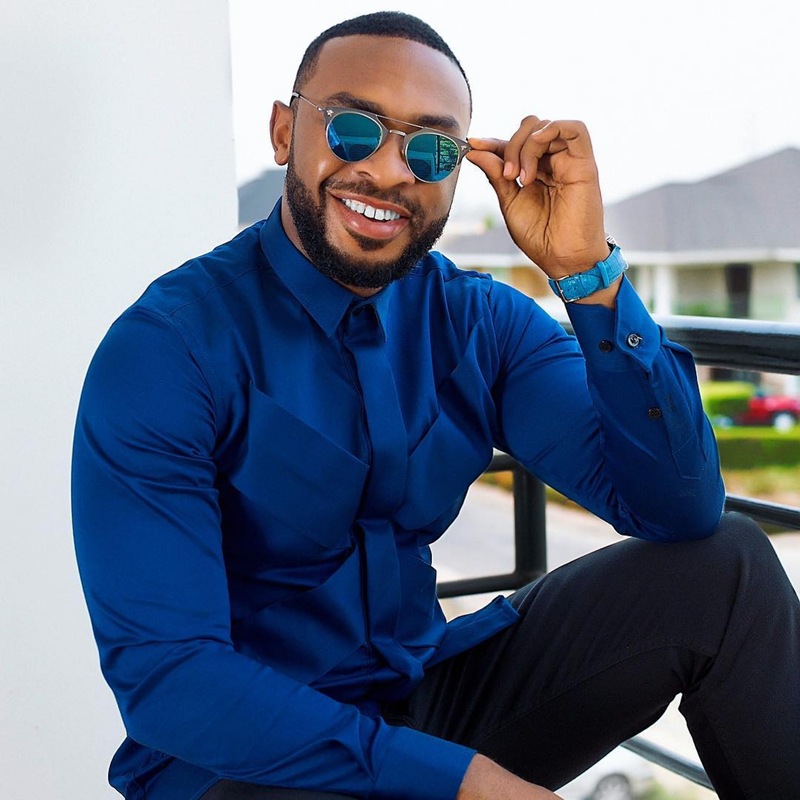 I could describe him as a delicious bowl of seafood okra but the beauty that is Enyinna pass Okra. 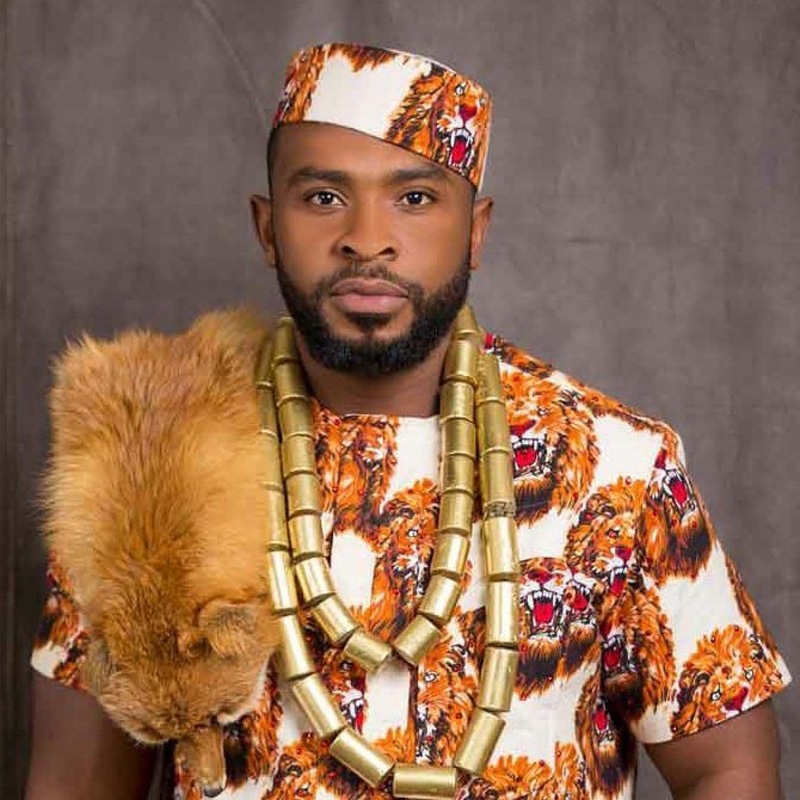 Enyinna’s face in Nollywood is nothing new, He has acted in different Nollywood movies, but I only noticed him in the movie “The wedding party” where he played Nonso Onwuka the brother to Dozie Onwuka played by Banky W.
Enyinna the beautiful is also an avid foodie, one who isn’t ashamed to cook or ask for seafood okra :p And as he also cooks, he surely deserves some accolades. I remember looking through his pictures on Instagram and being swooned, of course it ended with me making a comment and him asking for a bowl of seafood okra. Enyinna, you see, I gat you bro! 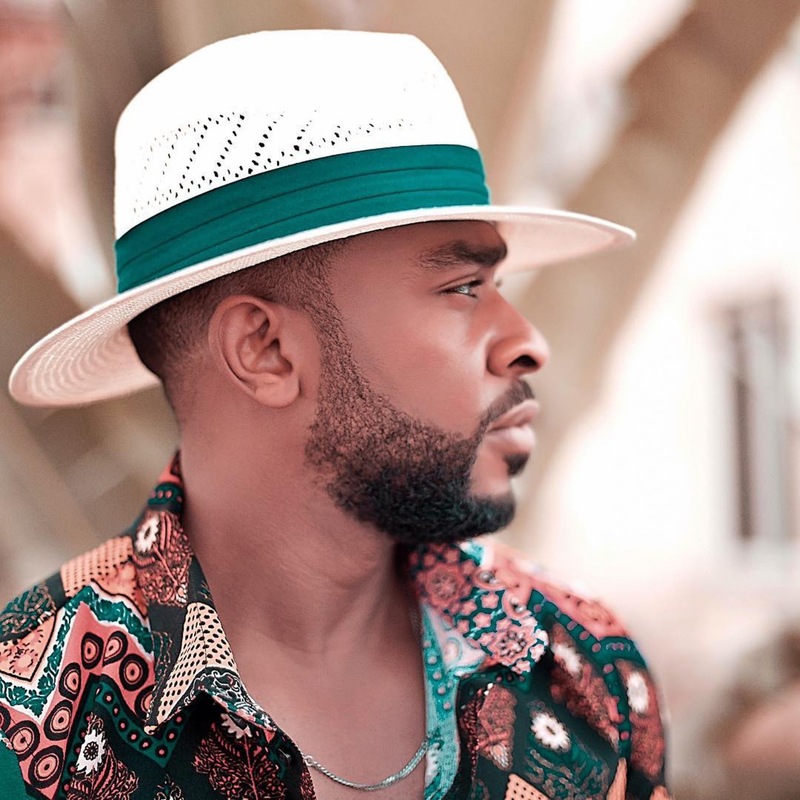 I refer to Enyinna as the only Nigerian, Igbotic cow boy. 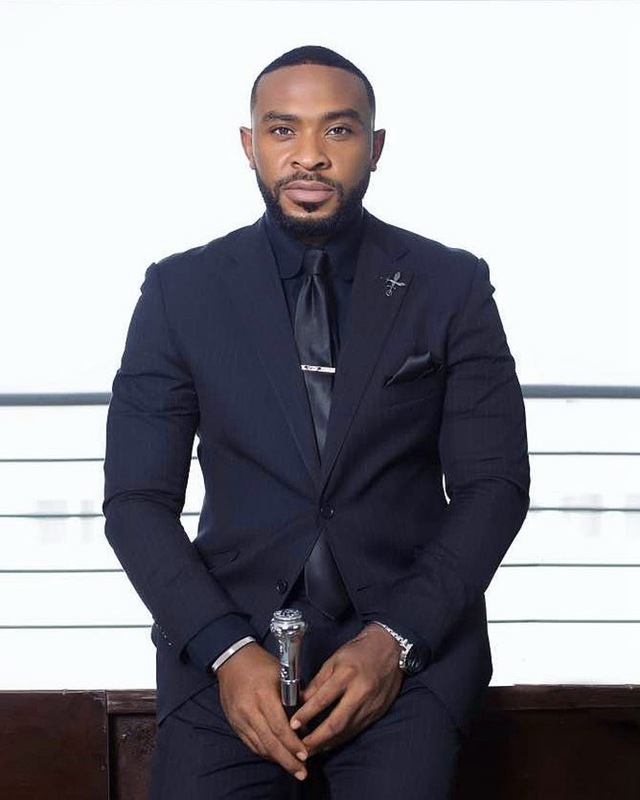 Apart from his acting skills, Enyinna has a very clean dress sense. The dude can wear anything and look like a million bucks. His baby face, his acting skills and his overall personality sets him apart from most male actors. 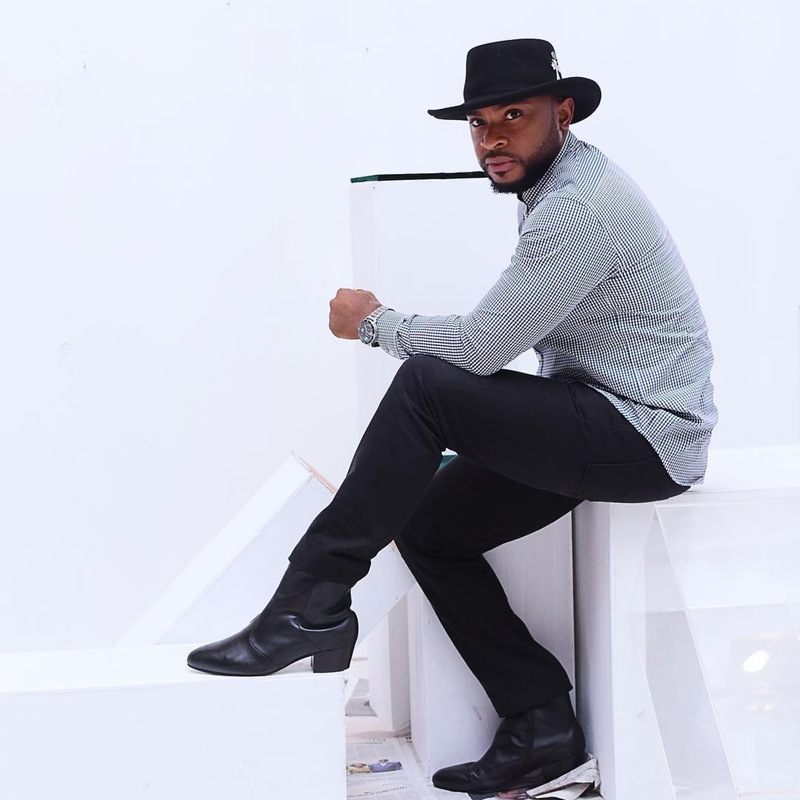 This entry was posted in Uncategorized and tagged 10 minutes with Eyinna, 10 minutes with Eyinna Nwigwe, Eyinna Nwigwe, jollof rice, lazychef, Nigerian food blog, Nigerian okra soup recipe, Nollywood, Nollywood segment, the wedding party. My third day in Florida saw me at the beach. It was beach time people! I went with no beach ready bathing suits but I was going to be at that beach come what may. Visiting South beach on Ocean drive was different from visiting Bahamas fish market which was at an area that reminded me a lot of Lagos :). Ocean drive compared to the other side of town was like night and day. I had to dip my toes in the clear beach water. It was a must. Who goes to Miami without going to South beach and eating beach side? I had to try a Coronarita. 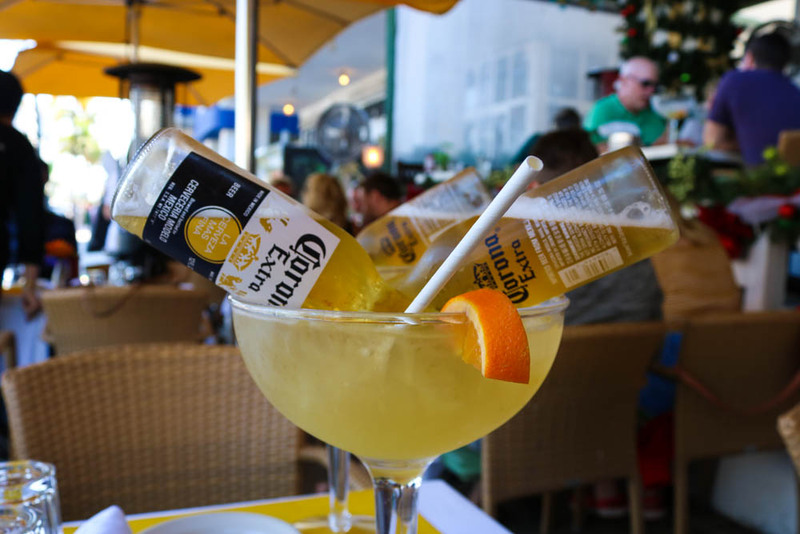 a Coronarita is simply margarita with one or two bottles of Corona turned upside down into a margarita glass filled with margarita and the beer slowly releases into the margarita as you drink from the glass. After about 30 minutes on the beach, we went looking for the famous Coronarita and while walking the most talked about side walks of Ocean drive, we were stopped by a very “don’t take no for an answer” waitress who talked us into trying the drinks at the tables of Majestic for a two for the price of one deal. She introduced herself as Christina while we sat down and within 10 minutes, she brought our drinks. She was such a tiny lady, I wondered how she held our drinks with her tiny hands. Although the sizes of the drinks and the two corona bottles in each glass seemed a little intimidating, I was too excited to let it kill my joy. I was going to experience this drink whole heartedly and without fuss. 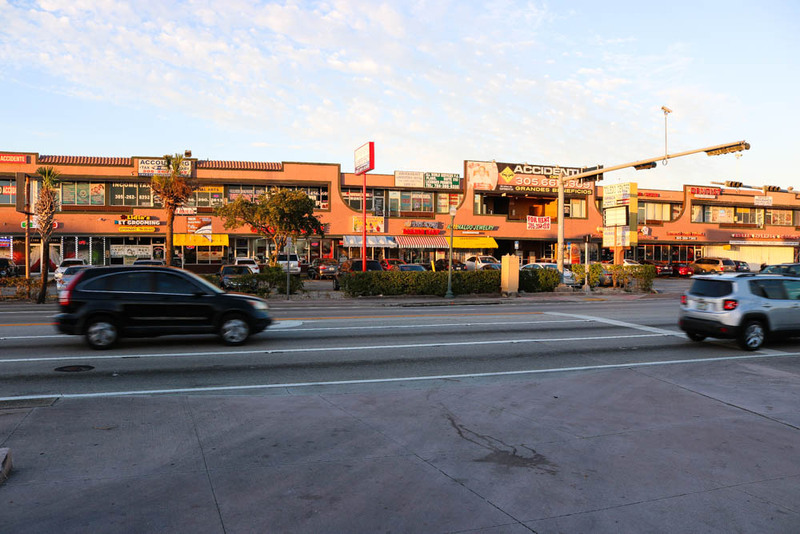 This entry was posted in food review, Restaurant review, Uncategorized and tagged Food review, majectic, majestic restaurant, miami florida, ocean drive miami, parts unknown, Restaurant review, south beach, travel for food, Will travel for food. 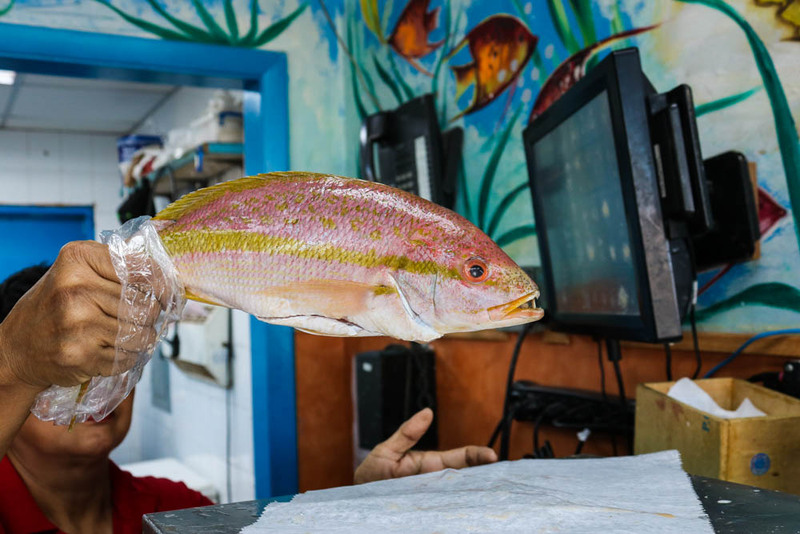 I have never been to the Bahamas, so when I was told that the Bahamas fish market was a great place to get seafood in Florida, I slept counting sheep because I couldn’t wait. 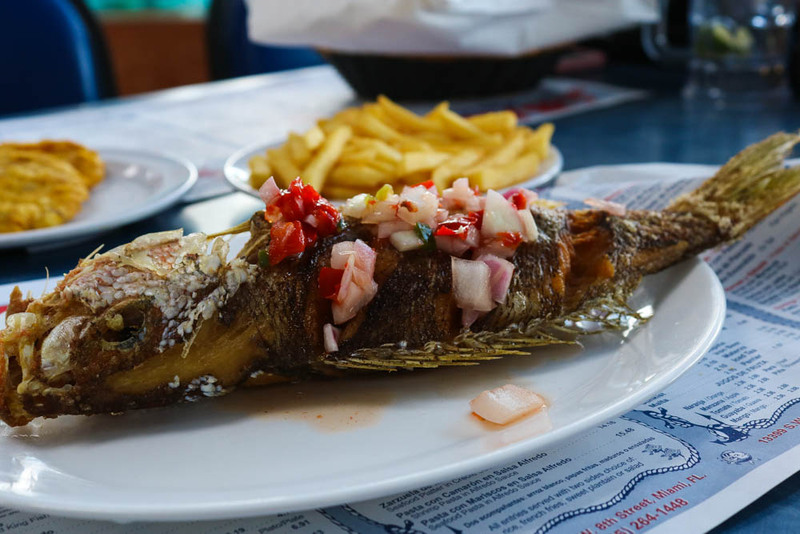 After watching an episode of “Parts unknown” with the late Anthony Bourdain eating fried fish in the Bahamas, I knew my experience was going to be kind of close. 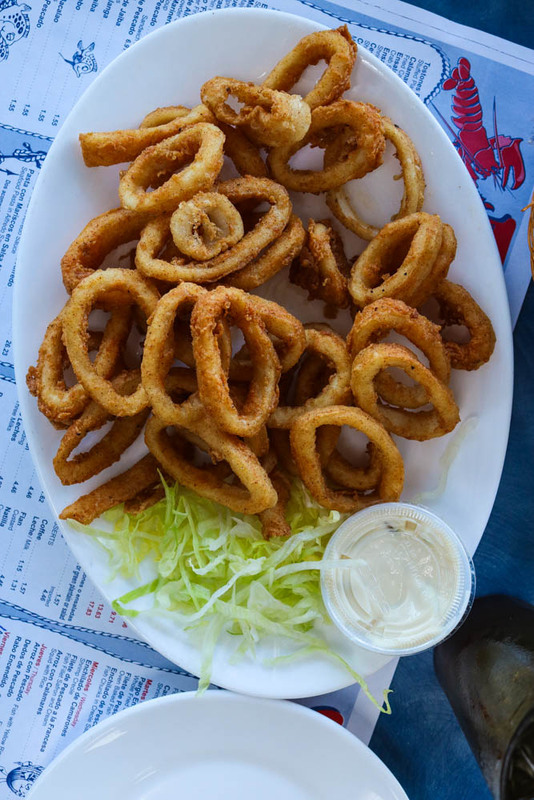 Besides that, I had always wanted to go to Miami because apart from it being kind of a one stop hub for Cuban food, I wanted to simply experience the beauty of the ocean and eat fried seafood; yes! fried seafood. 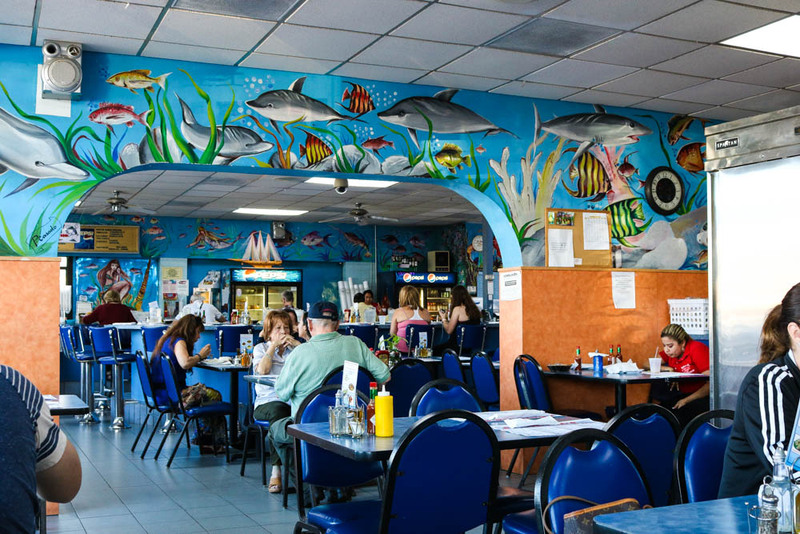 Walking into the restaurant felt like being human in an aquarium as the restaurant was painted to look like one or even like the sea. If I wasn’t sane, I would have thought I was Ariel from the little mermaid. The Bahamas fish market reminded me of a small Nigerian food shack/diner. It was filled with friendly people and really good food. In Nigeria, we have places where one can get the point and kill fish. 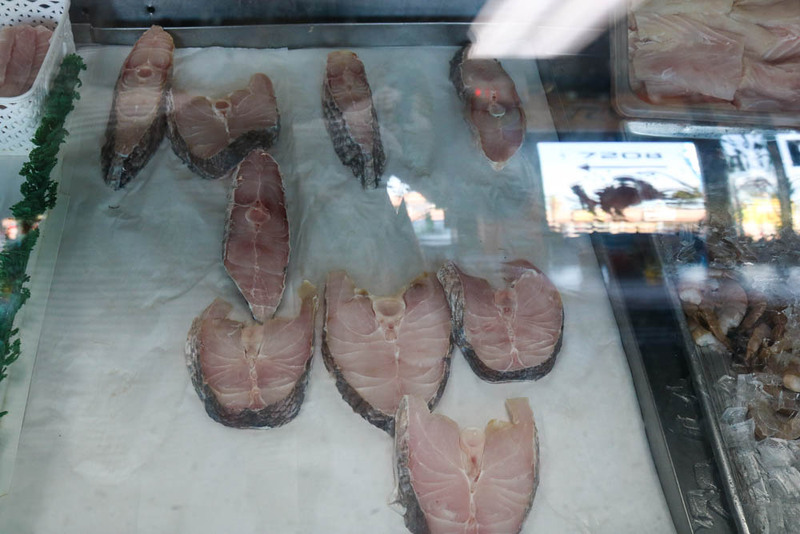 It’s a place where when you visit, they show you an array of live fish and seafood. You pick the one that interests you and tell them how you want it cooked; according to what they have on the menu. 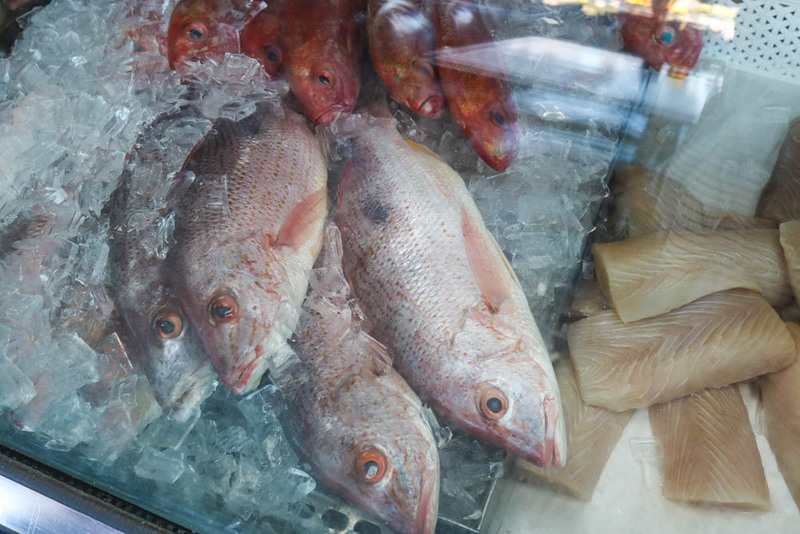 In Bahamas fish market, the fish/seafood is already harvested and cleaned then placed in an ice box to be preserved for the customers for the day. I ordered some fried oysters as my appetizer before realizing they had ceviche. If you have never had ceviche before, you have got to try it. 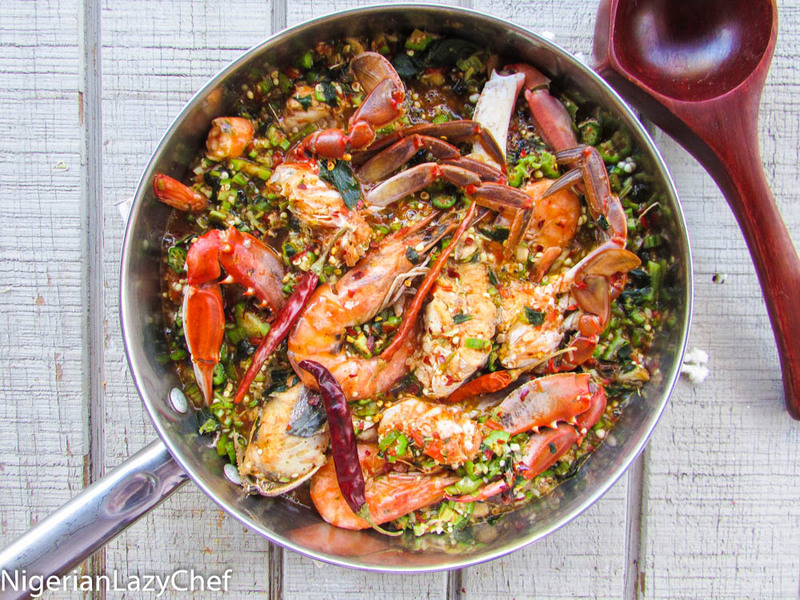 It’s basically a seafood dish made from fresh seafood/fish cured with lemon or lime. It is then seasoned with spices, onions and herbs. Personally, I prefer ceviche to sushi; even if they both serve different purposes and taste differently. After ordering oysters for my appetizer, I decided to order a serving of fried fish for my main course. To make my order of fish, Nadia walked me to the ice box where they were being preserved and I had to make a choice. I was spoiled for choices and though I wanted some cod, I settled for a pound of yellow tail snapper, yellow rice and tostones; (pronounced “tos..to..nes”) which is simply twice fried unripe plantains. The oysters, fresh and cleaned; then seasoned, battered and fried was served piping hot with fresh lime and tartar sauce. I have to say it was one of the freshest and most delicious oysters I ever had. It didn’t taste like it came from a freezer. I kept munching on each piece forgetting I had ordered some fish for my main course. My fish was brought to me by Nadia and just like the oysters, it was piping hot and you could smell the crispiness of the oil. You know when Nigerians ask “can you hear the smell?” I could hear the crisp smell and I dug right in using my hands. 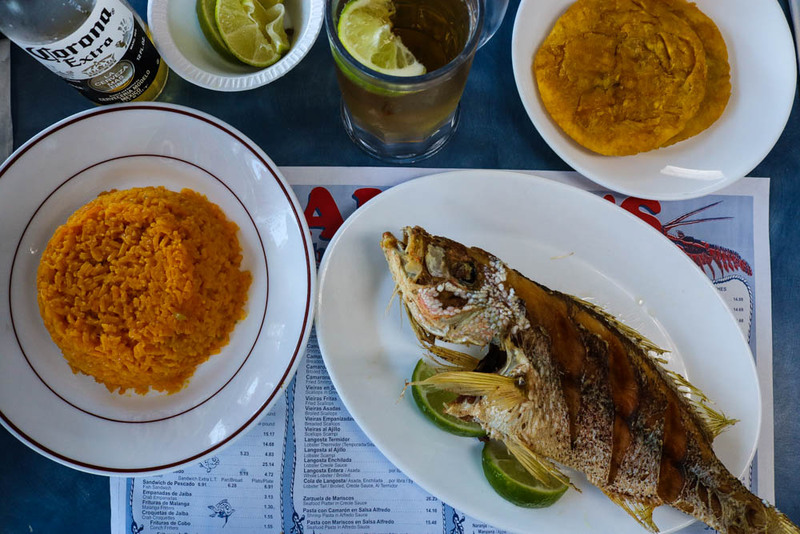 I ate a bit of the rice and some of the tostones, but the fish was the main attraction. The whole dish was served with a tiny ramekin filled with a mixture of chopped sweet peppers and onions drenched in lime. It kind of reminded me of eating fish and attieke. This mixture was what I instinctively poured on my fish and the taste went from 100-100 in a matter of seconds. At this point, I had to order a cold bottle of Coors Light which was served with a chilled glass and a lime wedge. 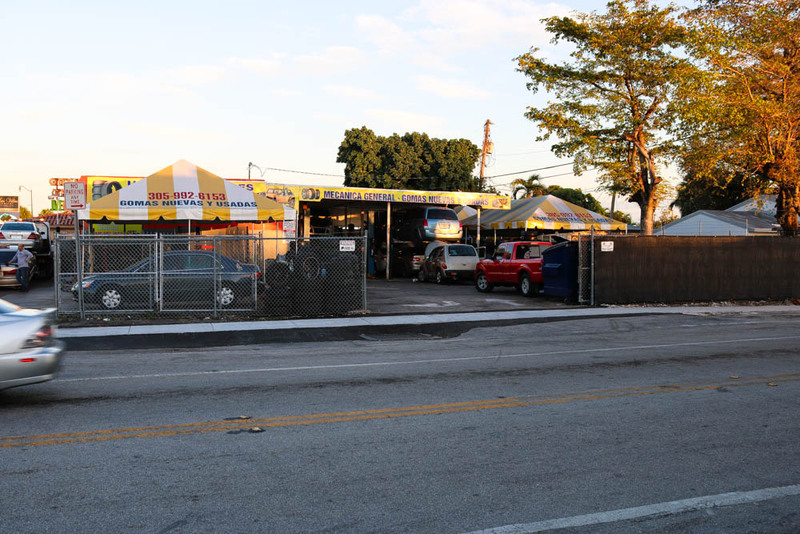 This entry was posted in food review, Restaurant review, Uncategorized and tagged bahamas, bahamas fish market, cuban food, florida, Food review, miami, miami florida, Restaurant review. If there’s one dish I appreciate my mother teaching me to make it’s one of my favorite warm salads; Ugba salad. 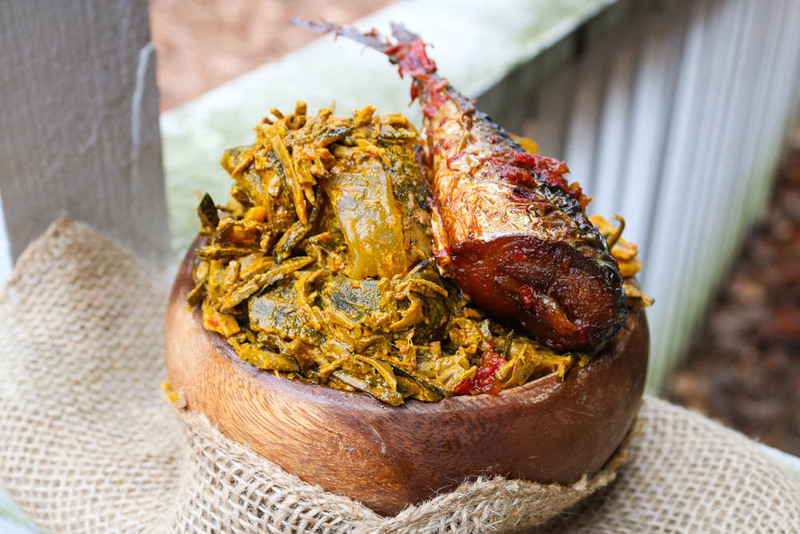 Ugba also known as Ukpaka by some Igbo dialects is simply Igbo for African oil bean. Growing up in Nigeria, my mother had a restaurant where she made Isi ewu and sold drinks. She had a lot of customers and her business grew to be famous until she had to go to catering school. 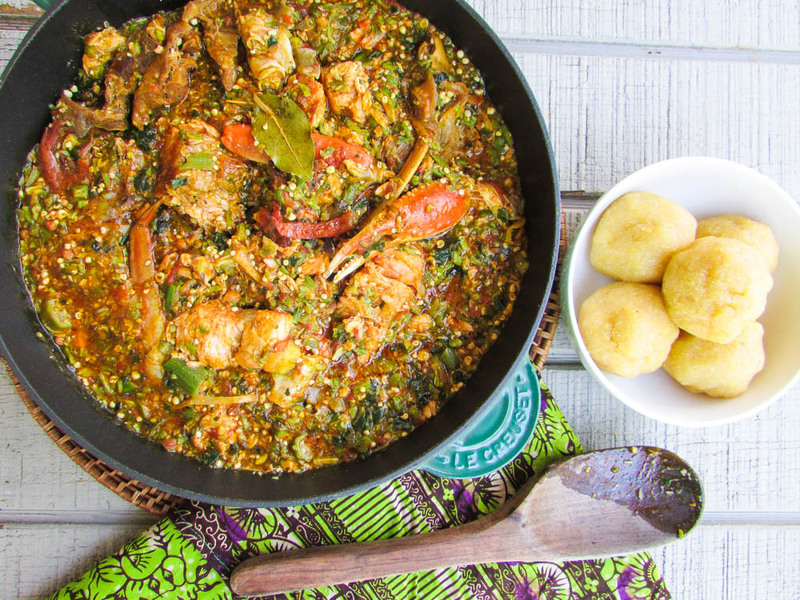 Through this Isi ewu dish, I learnt about ugba and how to make it. 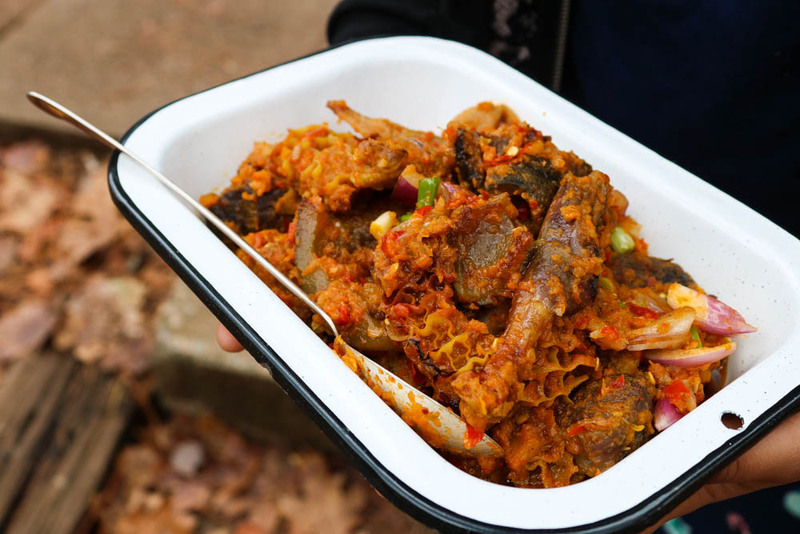 I also learnt how to make Nkwobi, which is a dish that can be made with both ugba and chopped cow foot. Another thing in my childhood I am happy about is my mother opening my pallets to different Nigerian foods. Now, I do the same for my Ajebutters and they eat most Nigerian foods without questioning; including Ugba. At a young age, I started enjoying local Nigerian dishes you wouldn’t really expect a child to understand; talk less of enjoying. Eating ugba at home was one of the ultimate treats mommy could ever give us. There was something about noshing on chewy cow skin and soft/melt in your mouth ugba. This entry was posted in Uncategorized and tagged Cnnfood, igbo, Nigerian blog, peppered fish, peppered ponmo, stock fish, Ugba. I remember being a little girl and sitting in a corner with an almost empty can; munching on salty morsels of corned beef and hearing my mom in the background telling me to be careful and use a spoon. As a child I had a joyful experience with corned beef. I say joyful because I really don’t have words to describe my childhood experience with food generally. I think my joyful experience stems from my mother being adventurous with food. She made corned beef sandwiches, she added it as a protein to salads and used it as a substitute for Nigerian meat pies and sausage rolls. When I first heard of Juka’s Organic, I wasn’t sure what it was. I was like “which one is Juka again?” Notwithstanding, I gave them the audience and I have to tell you it was one of the most pleasant audience I had ever granted. 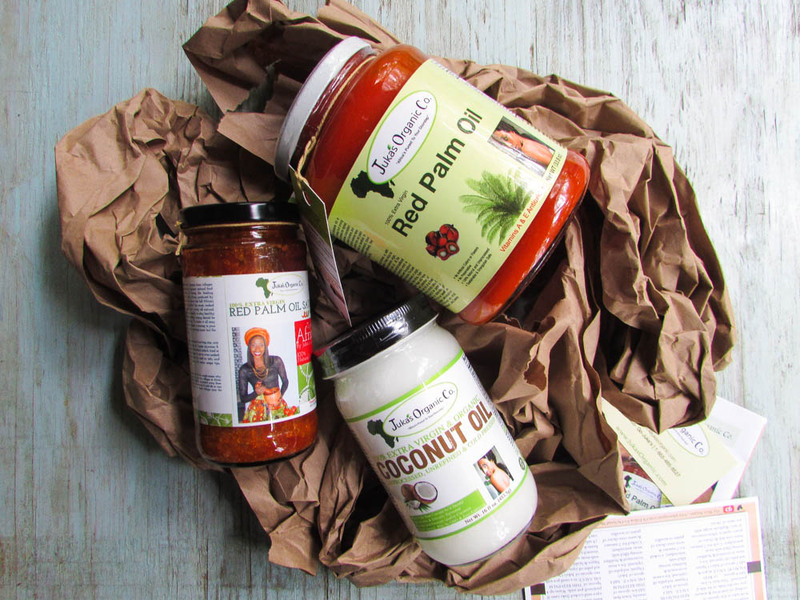 Juka’s Organic is a company that sells African products and one of my favorite things, the African organic Palm oil. Receiving the palm oil in the mail, the box smelled like sweet plantain chips. On opening it, it was a box of palm oil, coconut oil and palm oil sauce. Although the oils smelled so sweet on opening them, I didn’t rush to taste them as I wanted to take my time to relish in each bottle. 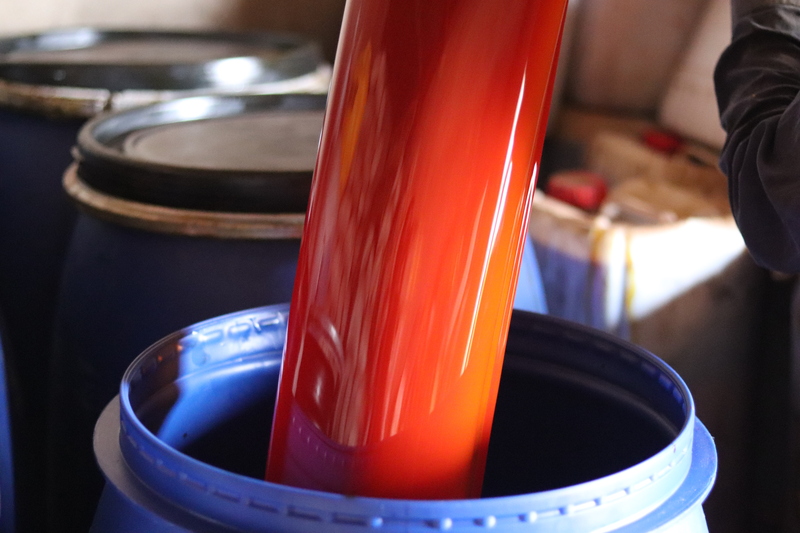 The first of the oils I tried was the palm oil sauce. It was not salty and it tasted freshly made. I had it with some boiled white yam and some corned beef sauce. It was so good I had to start adding it in everything we ate. Even with beans and African bread it was tickety boo! The coconut oil wasn’t any different. It tasted coconutty and wholesome. I used it for my oil pulling and I made some noodle stir fry. Freshness guaranteed! My favorite was the Red Palm oil. Juka’s Organic palm oil is the truth! The whole truth and nothing less. I’m a cook/chef and I am someone who cooks for people so I use a lot of palm oil in my soups and sauces. I know people who do not like palm oil. They would eat anything but palm oil until Dr. Oz and even Oprah endorsed it as a superfood. 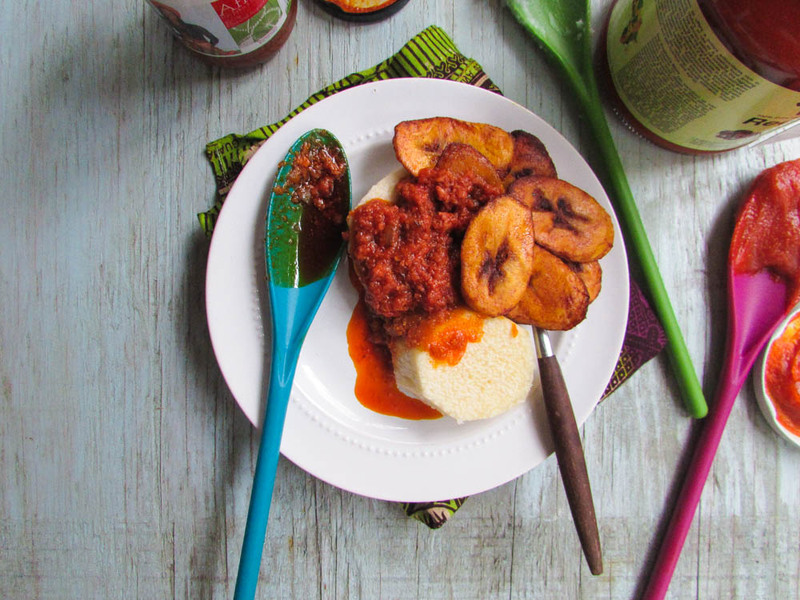 I think as Africans, we don’t understand the value and wholeness of our foods. And I digress. This entry was posted in Uncategorized and tagged african cooking oil, African villages, cooking oil, juka, juka's organic palm oil, organic palm oil, palm oil, wilhelmina models. I am a huge fan of Okra thanks to my ajebutter and my dad. There’s no telling how many times I make it in one week. Even my son the gluten free ajebutter loves and prefers a meal of okra over anything else. Infact he calls the Nigerian stew and okra the red and green soup. Today we will take a trip to Ghana. 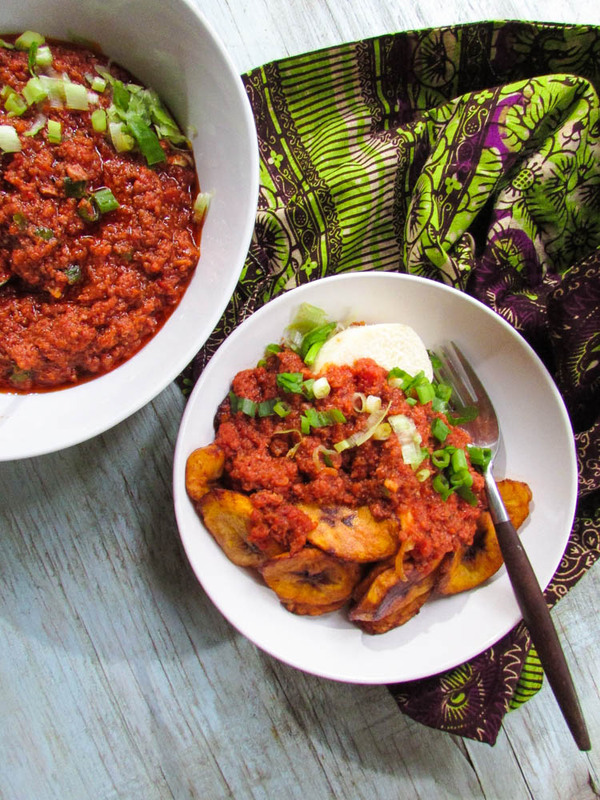 Ghanaians and Nigerians do have a lot in common; especially when it comes to food. Apart from Egusi, Jollof rice and suya, we do share similarities in how we make our okra and to them it’s called Okra stew. Maybe because of how it’s made with a tomato base. Not forgetting that the Yoruba’s do call theirs Okra stew too. My ajebutter had to get some allergy shots and with him crying “mommy mommy” I had to make something quick. And what better recipe to make than one with okra. It’s quick it’s easy and it’s damn delicious! I have seen some of my Ghanaian neighbors eat this soup with banku. A fufu mix of corn and cassava. Although I didn’t make mine with banku, we enjoyed it with yellow garri. As in the garri dey draw like pounded yam kaiiii! 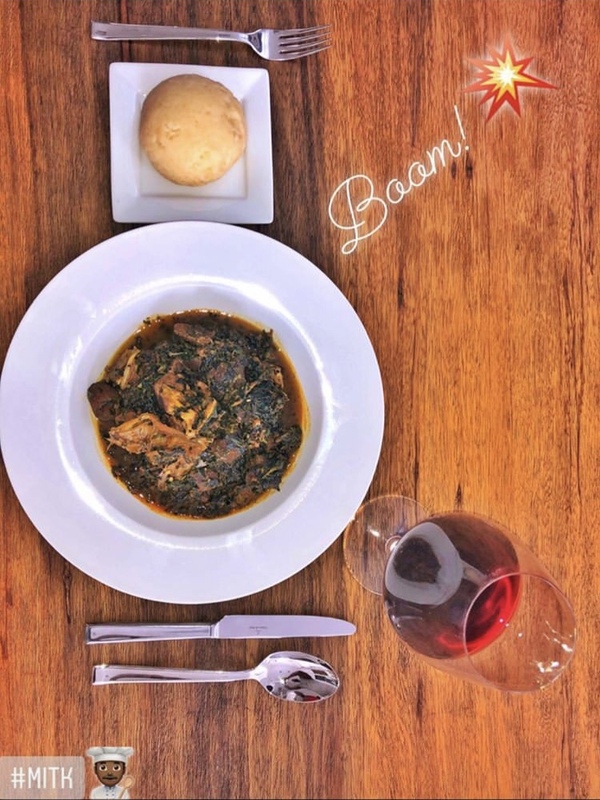 This entry was posted in Local dishes, Local Recipes, Meat stew, Okra recipes, Okra soup, Uncategorized and tagged fufu, Ghana, Ghanaian okra stew, Okra soup, Okra stew.